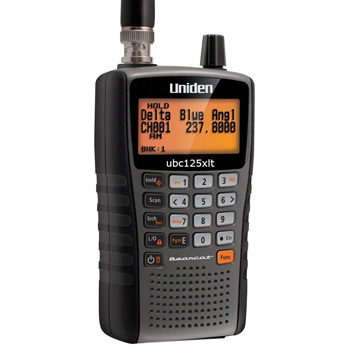 The new Uniden UBC125XLT is a compact 500 channel handheld scanner, which covers 25-88MHz, 108-174MHz, 225 - 512MHz and 806 - 960MHz with 5/6.25/10/12.5KHz frequency steps. It includes Military Aircraft Band, CTCSS/DCS Squelch Modes and Alpha Tagging features. Ideal for listening to the communciation from Civil Air traffic Control, Boats, truckers operating on CB radio, Ham Radio/Amateur Operators, Sporting events, Churches and Mosques etc. The scanner comes complete with 2 x AA NiMH Rechargeable batteries, AC/DC adaptor with both EU 2 Pin and UK 3 Pin plugs, a USB cable, BNC antenna & belt clip.